Hello, and thank you for taking the time to visit our church website. My name is David Stangret, and I am the founding pastor of Bible Believers Baptist Church. I was born in 1959, and raised in a Roman Catholic home where we rarely went to church. When I was 15 years old, Robert Lindsay Gatto, a friend of mine who had just recently been saved presented the gospel of Jesus Christ to me one evening. He told me that I was lost and needed to trust the Lord Jesus Christ as my personal Saviour for forgiveness of my sins, and to escape the coming judgement of God upon this world. Later that night, I bowed my head in repentance towards God, I asked the Lord Jesus Christ to be my personal Saviour. I started to attend Wishing Well Acres Baptist Church in Agincourt, and during an altar call I went forward for baptism. I was Biblically baptised by immersion and joined that church. Many years later, I attended Brother Gatto's Ordination service and joined the Independent Baptist Church he had started; The Lighthouse Baptist Church of Toronto. I was a member at Lighthouse for over 14 years, and during that time I worked in the bus ministry, I was a Sunday School teacher, a Deacon, the soundman, an usher, and did pretty well anything else you could think of. While attending Lighthouse, I met my future wife Carolyn, and together we have five beautiful children. Our oldest is our only son, and after him came four beautiful girls. 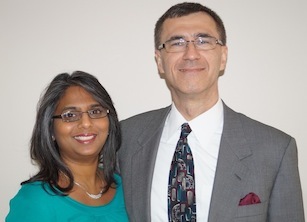 In 2001, Lighthouse amalgamated with another Baptist church north of Toronto in a town called Stouffville. This left a spiritual void in the Scarborough area of Toronto for an Independent Bible believing Baptist church. For many years the Lord had been working on my heart about serving Him full time in the ministry, and in 2002 I notified my Pastor that the Lord had impressed upon me the need to start an Independent Baptist Church in the Scarborough area of Toronto. We had our first Sunday morning meeting in June of 2003. My wife, myself, our five children and one couple were in attendance at that meeting. Since that first Sunday, our attendance has grown to average about 60 people on Sundays. I hope that you will take the time to come and visit with us. If you have any questions, please feel free to call me and I will do my best to answer what ever questions you may have.